All NGS Travel players are required to wear an official uniform for games. The jersey is orange with the player’s last name and number (assigned by the registrar) on the back and the NGS logo on the front. The shorts are navy and the socks are orange. Soccer.com handles all orders and distribution of travel uniforms. Parents are responsible for ordering the correct sized jersey, shorts and socks. You only need to order a new travel uniform if your daughter does not have one or her current uniform does not fit. Our partnership with Soccer.com will provide you with a 1-stop-shop for all of your travel uniform and gear needs. In July, look for an email from Soccer.com reminding you to order your uniform for the 2017-2018 season. If you lose the email, you can use to link below to connect to our Soccer.com site and search for your player by name. Check the name and number in the email for accuracy. Up to 16 characters can be printed on the jersey. IMPORTANT: if you have a name that is longer than 13 characters, do not order online. Instead, call Soccer.com customer service at 800-967-8326 to place your order. Click the link to go to your player-specific page or use to link below to connect to our Soccer.com site and search for your player by name. Select what you need. You can order all the components of the uniform or single items. Double check your basket contents, player last name and number (assigned by registrar). Your order will be delivered directly to you! Please place your order at least 3 weeks before the season begins. If you order after August 8 there is no guarantee that you will receive your order before the start of the spring season. Our uniform style changed slightly in spring 2017. We strongly suggest that you confirm the size of the jersey and shorts before ordering. Samples are available to try on at Lapels Dry Cleaners, 319 Walnut Street, Newtonville (617-527-6700). Because the jerseys are custom orders, there are no returns or refunds. If you have any questions about your order, please call Soccer.com customer service at 800-967-8326. 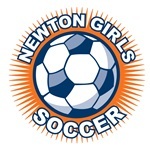 Other questions can be directed to registrar (at) newtongirlssoccer.org.